I’m lucky to call Meb my friend. Not only is he an outstanding human, he is an outstanding athlete that has put in the time training, day in and day out. He has won more races than I can remember. The most memorable are the Boston Marathon in 2014, the NYC Marathon in 2009 and qualifying for the most recent USA Olympic Team. Believe it or not, I met Meb before I was even a chiropractor. I was living in Mammoth, California and he was too. It is not uncommon for high-level runners to live in the mountains and train at altitude. Have you ever tried running in freezing cold temperatures or in the snow? That’s what it takes to be an elite athlete. You have to be religious about your training, your food and your routine. You have to do what others won’t. Earlier this year, we we had a group of students in our office that were considering chiropractic as a career for a pre-chiro club meeting. Meb is a huge advocate of chiropractic, and I thought to surprise them by inviting him. It was very cool to see their faces light up when he walked into our office that evening. There you have met…there are no shortcuts. You must be committed to show up in all ways, all of the time, every time. 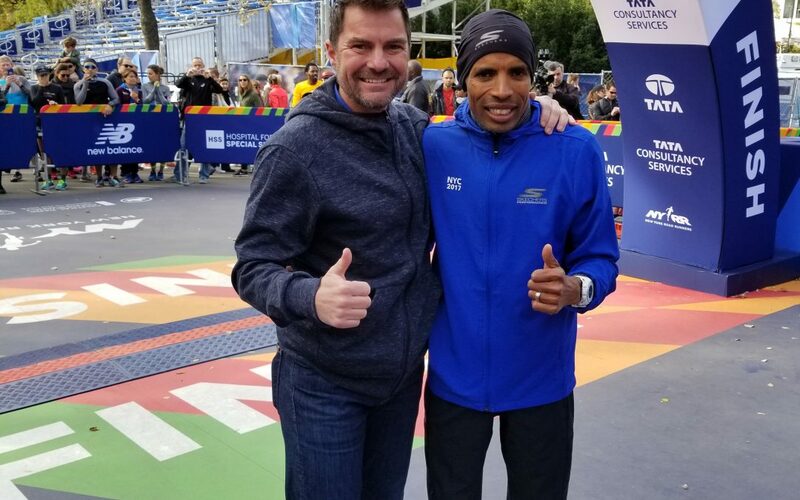 Meb officially announced his retirement, and chose the NYC 2017 Marathon as his last event. His 26th marathon, and we certainly couldn’t miss it. We flew cross-country to watch him cross the finish line one more time. Bittersweet. It was so exciting to be there and cheer him on along with everybody else. We just got back from New York yesterday! What a legacy! Emotional! Exciting! Exhilarating! It has been my honor to be your chiropractor, and most importantly, your friend. You are an amazing example of humility and respect. I wish you a lifetime of blessings and good fortune. San Diego is lucky to have you and your family! Here’s to chiropractic and fantastic health!